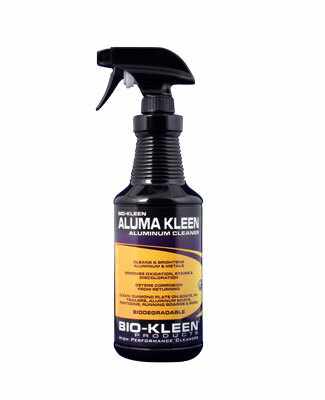 Bio-Kleen Aluma Kleen is a biodegradable, non toxic aluminum cleaner that cleans and brightens aluminum and metal surfaces including on your boat, pontoon, RV, trailer, truck, car and others. Dilute 50/50 for an automotive acid wash: remove rust speckles and oxidation from paint, remove salt oxidation from exterior, thoroughly clean prior to waxing and polishing. Clean and de-oxidize any aluminum or metal surface, clean pontoons, clean aluminum boats, clean running boards, step plates and diamond plate, clean metal tanks on trucks and RV, clean metal trimming on trailers and RV, clean rust from parts and tools, cleaning wheels, acid rim cleaner, acid wash for your vehicle.